In the present work we investigated the photodegradation of tartrazine by silicon nanowires (SiNWs) without presence of H2O2. SiNWs were elaborated with a simple chemical method termed metal-assisted electroless etching. Also, SiNWs modified with copper was experimented as photocatalysts for the degradation of tartrazine and the effect of copper concentration was examined. The results show that silicon nanowires modified with high concentration of copper exhibit the best photocatalytic activity with a degradation rate follows the pseudo-first-order kinetics. Around 50% of all dye diversity is represented by azo dyes and due to their extensive applications and persistence they pose a clear environmental hazard . Water is an essential natural resource for human being and for all life forms [2,3]. The use of dyes in textile, pharmaceutical, cosmetic and food industries leads to the pollution the wastewaters with different concentrations. Consequently, the reuse of wastewaters has become an absolute necessity. A wide range of methods for the removal of synthetic dyes from wastewaters, including physical adsorption, electrochemical oxidation, and chemical oxidation were proposed. These methods are not destructive and they only transform the pollutant from one phase to another. So, there is an urgent need to develop innovative, more effective and inexpensive techniques for treatment of wastewater . Heterogeneous photocatalytic oxidation, one of the Advanced Oxidation Processes (AOPs), has attracted much attention in recent years and has proved to be a promising technology for remediation of organic pollutants at ambient conditions [5-12]. Photocatalytic oxidation, in the presence of semiconducting materials, of organic compounds with environmental concern was studied extensively during the last 20 years and it was demonstrated that heterogeneous photocatalysis can be an alternative to conventional methods for the removal of organic pollutants from water and wastewater . This process is based on the direct or indirect absorption by a solid, usually a semiconductor, of photons of visible or UV light. When this semiconductor is illuminated, it can generate electron-hole pairs by promoting an electron from the valence band to the conduction band, thus leaving a hole in this band. These holes can react with H2O or hydroxyl groups from the reaction medium and produce highly reactive hydroxyl radical species. On the other hand, the electrons promoted to the conduction band, can reduce the molecular oxygen to peroxide anion to form hydrogen peroxide or organic peroxide in presence of organic compounds . Radical hydroxyls are strong oxidizing agents that can degrade organic compounds or their intermediaries to reach final products such as CO2, H2O. The dye “tartrazine” experimented in this work, is an acidic azo dye with a sulfonic group as an auxochrome that is highly water soluble and polar. It is widely used in cosmetics, drugs, electroplating, pharmaceuticals and textile industry and also as food colorant [15,16]. Tartrazine seems to cause the most allergic and intolerance reactions, particularly among asthmatic patients, migraines, eczema, thyroid cancer, and lupus . The dye has the following structure (Figure 1). Figure 1: Chemical structure of tartrazine dye. Few works were reported in literature concerning the tartrazine photodegradation using SiNWS as photocatalyst. In the present work, we focused on kinetics of the tartrazine photodegradation while using unmodified and Cu-modified SiNWs prepared by Ag-assisted electroless etching method as photocatalysts. Tartrazine powder with high purity (≥95%) was used without further purification purchased from S.A color. Silicon obtained from Siltronix was used to elaborate the photocatalysts. All chemicals used in this study such as copper (99.99%), hydrogen fluoride (50%), oxygen peroxide (30%), nitrates of silver (99.8%), acetone (98%), ethanol (99.8%), sulfuric acid (95–97%) and nitric acid (69%) were obtained from Sigma–Aldrich. Then, the Cu-modified SiNWs were rinsed with water and dried under a gentle stream of nitrogen. The difference between these two solutions lies in the amount of copper that will be deposited onto SiNWs. In this application of photocatalysis, we used silicon nanowires samples unmodified and modified with copper nanoparticles of surface about 1.5 cm x 0.7 cm as catalysts. The photocatalyst was immersed in a quartz cuvette containing a 4 mL aqueous solution of tartrazine with an initial concentration C0=1.035 x 10-5 mol/l. The solution were irradiated with UV light (λ=365 nm) at room temperature for 200 min. 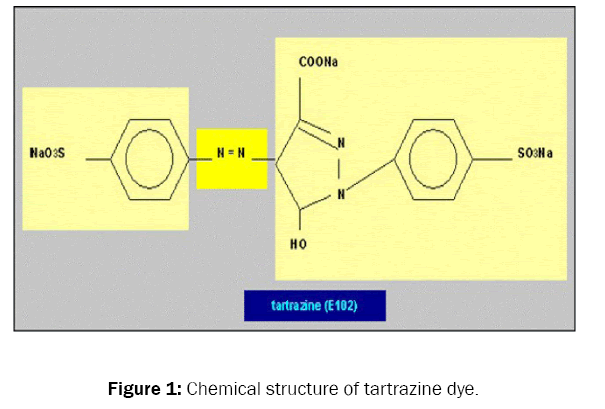 The progress of the degradation of tartrazine was monitored every 20 min by UV-Vis spectroscopy. The morphology of silicon nanowires unmodified and modified with copper nanoparticles were examined by scanning electron microscopy (SEM) Philips (XL30). The absorption spectra of the tartrazine solutions in quartz cuvettes with an optical path of 10 mm were recorded using a CARY 500 “VARIAN” UV–vis spectrophotometer. The wavelength range was 200–600 nm. Morphology of silicon nanowires: Figure 2a depicts that silicon nanowire are uniformly formed and vertically aligned to the surface forming a perfectly clear interface between nanowire layer and substrate as can be observed in cross-sectional SEM view (Figure 2b). The length of nanowires is roughly 13 μm and their diameter ranges from 20 nm to 100 nm. Also, Figure 2b shows that the nanowire tips stick together forming bundles due to van der waals’ forces . Figure 2: Plan (a) and cross-sectional (b) view SEM images of unmodified SiNWs formed by etching in 9.65 M HF- 0.033 M AgNO3 at 50°C for 10 min. Figure 3a and 3b depicts typical cross-section SEM images of the Cu-modified SiNWs in the solution 0.14 M CuSO4-1.35 M HF for 2 min at room temperature. It can be seen that the CuNP are deposited onto nanowire walls reaching a depth of about 8 μm. They are of spherical shape with a diameter in the range 46–110 nm. Figure 3: Cross-sectional view SEM images of SiNWs modified with copper nanoparticles in solution 0.14 M CuSO4- 1.35 M HF for 2 min at room temperature (a) and at high magnification (b). When, the deposition solution of low concentration of Cu (0.02 M) was used, a very low amount of CuNP was deposited onto SiNWs as can be shown on the plan SEM image of the Figure 4. Figure 4: Plan view SEM images of SiNWs modified with copper nanoparticles in solution 0.02 M CuSO4 - 1.35 M HF for 2 min at room temperature. The spectrum absorption of tartrazine shows two main bands, one at 257 nm and another at 428 nm (Figure 5). The band at 257 nm is characteristic to the aromatic rings and the 428 nm can be assigned to the n-π* transition of the N=N, C=N and C=O groups, responsible for the color of the dye . Figure 5 shows that when we have not used SiNWs as photocatalysts, the absorption bands decrease very slightly when the UV irradiation time is increased. This means that the tartrazine is very stable under UV irradiation in the absence of catalyst. Figure 5: UV-vis absorption spectra of tartrazine after UV irradiation without photocatalyst before and after UV irradiation. Figure 6 shows the photocatalytic degradation rate of tartrazine (A/A0) without and with presence of unmodified SiNWs, where A is the concentration after irradiation and A0 is the initial concentration of tartrazine. A slight improvement of the photocatalytic activity can be noted when hydrogen terminated silicon nanowires H-SiNWs and oxidized silicon nanowires Ox-SiNWs are used as photocatalysts. Indeed, degradations of 27.4% and 17.7% were obtained after irradiation for 200 min for H-SiNWs and Ox-SiNWs, respectively. Figure 6: Variation of concentration of tartrazine against time for the photolysis process (a) and using: (b) Ox-SiNWs, (c) HSiNWs, (d) SiNWs modified with low concentration of Cu and (e) SiNWS modified with high concentration of Cu. The high photocatalytic activity of H-SiNWs compared to that of Ox-SiNWs can be attributed to electronic deficit of H atoms in Si-Hx terminating surface which may serve as electron traps and can accelerate electron hole- pair (e--h+) separation; thus increasing photocatalytic activity of samples . Also, Shao et al shown by XPS the H-SiNWs are partially terminated with a fluorine ion, which can help to maintain an excellent photocatalytic activity compared to Ox-SiNWs . Similar results were obtained by Megouda et al and Brahiti et al for the photodegradation of Rhodamine B and Methylene blue, respectively [23,24]. Figure 7 shows that the efficiency enhances and becomes more significant when the SiNWs were loaded with Cu using solution (Cu1). A degradation rate of 34.23% is obtained after UV irradiation 200 min. However, when the density of the Cu NPs on SiNWs was significantly increased, a huge increase of the photoactivity was observed. Indeed, the degree of tratrazine degradation using the solution (Cu) for deposition is about 67.45% after 200 min. Figure 7: UV-vis absorption spectra of tartrazine before and after UV irradiation in the presence of SiNWs modified with (a) high concentration of copper and (b) low concentration of copper. The highest photocatalytic activity of the sample modified with CuNPs could be attributed to the ability of CuNPs to facilitate electron–hole separation and to promote electron transfer process in the catalytic photodegradation reaction. This is due to the higher work function (4.7 eV) . In addition, it can be ascribed to the oxidation of the Cu nanoparticles as suggested by Naama et al. to explain the enhancement of photocatalytic efficiency observed after oxidation of Cu nanoparticles . Because, it is well known that copper oxide phases promote the production of hydroxyl radicals OH•, which are strong oxidizing agents for organic pollutants [17,26]. With Kappat is the apparent constant of the reaction rate which is the slope of the curve versus t.
The values of Kappat obtained for different photocatalysts are listed in Table 1. Table 1: Pseudo-first-order apparent constant values for different catalysts. The Table 1 shows that the rate constants of photolysis and the photocatalysis in the presence of Ox-SiNWs are very low; this shows that reaction processes are too slow, while a slight enhancement of the reaction process is noted when H-SiNWs and SiNWs modified by Cu nanoparticles with the solution (Cu1) were used as photocatalysts. The SiNWs modified by high concentration of copper using the solution (Cu) provides the fast reaction process as indicated in the Table 1. The catalyst reusability is one of important performances of the photocatalyst, because a slow cost of the treatment of dye effluent is needed. To assess the stability of the photocatalyst, SiNWs modified with high copper concentration with the solution (Cu) were used for several photocatalytic process runs. The results in Figure 8 indicate that the activity of SiNWs (Cu) slightly decreased and 53.43% tratrazine degradation was achieved after second run (test 2). However, after storage in air for three months, we found that the activity is increased even becomes higher than that of the first run. A tratrazine degradation rate of 76.69% is accomplished after UV irradiation 200 min (test 3). This may be due to the complete oxidation of the copper nanoparticles surface in the open air causing the formation of CuO and Cu2O as already aforementioned. This promotes the production of hydroxyl radicals OH* which increases degradation of tartrazine. Figure 8: Temporal course of the photocatalytic degradation of tartrazine using Cu modified silicon nanowires (Cu) as photocatalyst for several times. The removal of the dye tartrazine by photodegradation was investigated using silicon nanowires unmodified and modified with copper nanoparticles with different concentration. The results of our study emphasize on the role of copper nanoparticles in the degradation process. Indeed, we find that SiNWs modified with high concentration of copper exhibit a good photocatalytic activity for the tartrazine degradation. A degradation rate of 67.45% is achieved after UV irradiation 200 min. The catalyst Cu-SiNWs with high concentration of copper when was stored at open air exhibited a better degradation of tartrazine due to the formation of CuO which promote the production of hydroxyl radicals OH*. Also, the result shows that the kinetics of tartrazine degradation follows the pseudo-first- order kinetics. The authors gratefully acknowledge the financial support from General Direction of Scientific Research and of Technological Development of Algeria (DGRSDT/MESRS). Chatterjee S, et al. Adsorption of congo red by chitosan hydrogel beads impregnated with carbon nanotubes. Bioresour Technol 2010;101:1800-1806. Boroski M, et al. The effect ofoperational parameters on electrocoagulation-flotation process followed by photocatalysis applied to the decontamination of water effluents from cellulose and paper factories. J Hazard Mater 2008;160:135-141. Boroski M, et al. Combined electrocoagulation and TiO2 photo assisted treatment applied to wastewater effluents from pharmaceutical and cosmetic industries.J Hazard Mater 2009;162:448-456. Mollah MYA, et al. Electrocoagulation (EC) – science and applications.J Hazard Mater 2001;84:29-41. Penpolcharoen M, et al. Degradation of sucrose and nitrate over titania coated nano-hematite photocatalysts. J Nanopart Res 2001;3:289-302. Fernandez A, et al. G. Preparation and characterization of TiO2 photocatalysts supported on various rigid supports (glass, quartz and stainless steel). Comparative studies of photocatalytic activity in water purification. Appl Catal B: Environ 1995;7:49-63. Liu H, et al. Titanium dioxide as photocatalyst on porous nickel: adsorption and the photocatalytic degradation of sulfosalicylic acid. Chemosphere 1999;38:283-292. Ma Y and Yao JN. Comparison of photodegradative rate of rhodamine B assisted by two kinds of TI02 films. Chemosphere 1999;38:2407-2414. Ma Y and Yao JN. Photodegradation of rhodamine B catalyzed by TiO2 thin films. J Photochem Photobiol A: Chem 1998;116:167-170. Bulter EC and Davis AP. Photocatalytic oxidation in aqueous titanium dioxide suspensions: the influence of dissolved transition metals. J Photochem Photobiol A: Chem 1993;70:273-283. Sclafani A, et al. Effect of silver deposits on the photocatalytic activity of titanium dioxide samples for the dehydrogenation or oxidation of 2-propanol. J Photochem Photobiol A: Chem 1991;59:181-189. Burgos M and Langlet M. Condensation and densification mechanism of sol-gel TiO2 layers at low temperature. J Sol–Gel Sci Technol 1999;16:267-276. Galindo C, et al. Photooxidation of the phenylazonaphthol AO20 on TiO2: kinetic and mechanistic investigation. Chemosphere 2001;45:997-1005. Akpan UG and Hameed BH. Parameters affecting the photocatalytic degradation of dyes using TiO2- based photocatalyste. A Rev 2009;170:520-529. Monser L and Adhoum N. Tartrazine modified activated carbon for the removal of Pb (II), Cd (II) and Cr (III). J Hazard Mater 2008;161:263-269. Mittal A, et al. Adsorption isotherms, kinetics and column operations for the removal of hazardous dye, tartrazine from aqueous solutions using waste materials-bottom ash and de-oiled soya, as adsorbents. J Hazard Mater 2006;136:567-578. Naama S, et al. Enhancement of the tartrazine photodegradation by modification of silicon nanowires with metal nanoparticles. Mater Res Bull 2016;76:317-326. Guo Z, et al. Optical properties of silicon nanowires array fabricated by metal-assisted electroless etching. In : Next Generation (Nano) Photonic and Cell Technologies for Solar Energy Conversion. Proc SPIE 2010; 7772:77721C. Brahiti N, et al. Synthesis of silicon nanowire arrays by metal assisted chemical etching in aqueous NH4HF2 solution. Appl Surf Sci 2012;258:5628-55637. Pertruta O and Meltzer V. Kinetics of tartrazine photodegradation by UV/H2O2 in aqueous solution. Chem Pap 2014;68:105-111. Megouda N, et al. Photocatalytic activity of silicon nanowires under UV and visible light irradiation. Chem Commun 2011;47:991-993. Shao MW, et al. Excellent photocatalysis of HF-treated silicon nanowires. J Am Chem Soc 2009;131:17738-17739. Brahiti N, et al. Enhanced photocatalytic degradation of methylene blue by metal-modified silicon nanowires. Mater Res Bull 2015;62:30-36. Bozack MJ. Surface studies on SiC as related to contacts. Phys Status Solidi B 1997;202:549. Qu YQ, et al. Photocatalytic properties of porous silicon nanowires. J Mater Chem 2010;20:3590-3594. Haouas M, et al. An NMR study of the nitration of toluene over zeolites by HNO3–Ac2O. PCCP 2001;3:5067-5075. Sauer T, et al. Kinetics of photocatalytic degradation of reactive dyes in a TiO2 slurry reactor. J Photochem Photobiol A: Chem 2002;147-154.